EMF Protection Pendant Nova Resonator? The Nova Resonator has technology that grounds you into the earth’s electromagnetic field, which is the natural home for your body. It’s the field that’s designed to nurture and heal you. Man-made EMFs pull you out of this field. What’s more, they disrupt the functioning of your cells and DNA, damages your immune & neurological systems setting you up for all sorts of health problems. The Nova Resonator gently pulls you back into this field so that EMFs are no longer harmful to you. As a result you will break away from the harmful effects of all man made EMFs. You’re safe. The Nova Resonator comes as a bracelet or an ankle bracelet too! Don’t like wearing a pendant? Buy the bracelet or ankle bracelet version. And–very importantly—if you have health challenges, the Nova Resonator can help you find your way back to good health. By taking the stress of EMFs off of your immune system, your body can begin to heal itself. The gentle, soothing energy of the Nova Resonator will calm your nervous system and help you to sleep more deeply. I do not have any health challenges, do I still need a resonator? Compare the photos below taken with a thermography camera, without and then with a Nova Resonator. Note the increase in the cooler colors with the addition of the Nova Resonator. The warmer colors indicate stress caused by radiation; the cooler colors indicate a lessening of this stress, as radiation leaves the body via grounding. 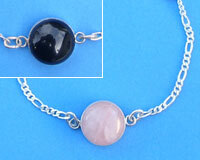 Length: 1-3/4 inches with 24" sterling silver chain. The chain may be replaced with any satin, leather or material of your choice and may be decorated with other gems or beads. Click the button below to add the Nova Resonator (Limited Stocks) to your wish list.